Conestoga’s renovation technician students haven’t been to class much lately, but that doesn’t mean they haven’t been learning. Over a two-week period, the 50 or so students in the program made renovations at two different sites in the community. Doug Lockston, an instructor in Conestoga’s School of Trades and Apprenticeships, oversaw the projects. The first site is a community support centre which is run by Ray of Hope. The building is a community centre for homeless, marginalized, disadvantaged and troubled people. The centre provides food hampers, clothing and laundry facilities to those who need it. They also prepare meals every day. The students’ job at the centre was to renovate Ray of Hope’s new administration office. Program director Jon Hill was pleased with the students’ efforts. “We’re really thankful for all the fantastic work that these guys are doing,” said Hill. The other site the students were working on was part of the rare charitable research reserve, in Cambridge. The reserve covers over 900 acres of land and is dedicated to preserving it for future generations. The building the students were renovating at rare is the new Every Child Outdoors (ECO) Centre. According to project manager Amanda Newell, the ECO centre’s goal is to provide outdoor environmental education to every child in Kitchener, Waterloo and beyond. They are also working toward creating a more established research centre. 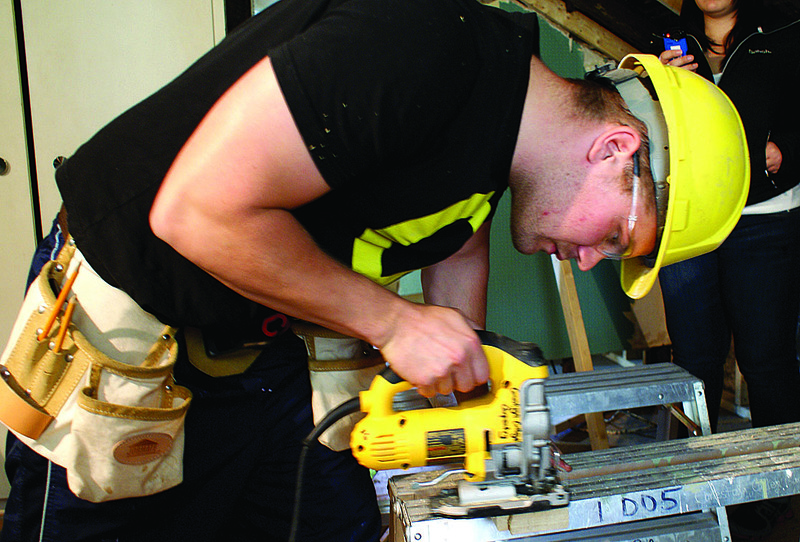 Renovation technician student Dylan Bennett has worked at both sites and enjoyed the experience. The School of Trades and Apprenticeships has been helping out in the community for four years and has done work for over 15 agencies which, according to Lockston, has amounted to over $600,000 in donations and labour.